You specify build settings in the Projects mode. To add a new build configuration, click Add and select the type of configuration you would like to add. You can add as many build configurations as you need. To delete the build configuration currently selected, click Remove. Select the build configuration you want to edit in Edit Build Configuration. The Qt version you want to use to build your project. For more information, see Selecting the Qt version. The tool chain required to build the project. By default, projects are built in a separate directory from the source directory, as shadow builds. This keeps the files generated for each target platform separate. Note: Shadow building is not supported by the Symbian build system. Also, shadow building on Windows is not supported for Maemo. If you only build for one target platform, you can deselect the Shadow Build checkbox. 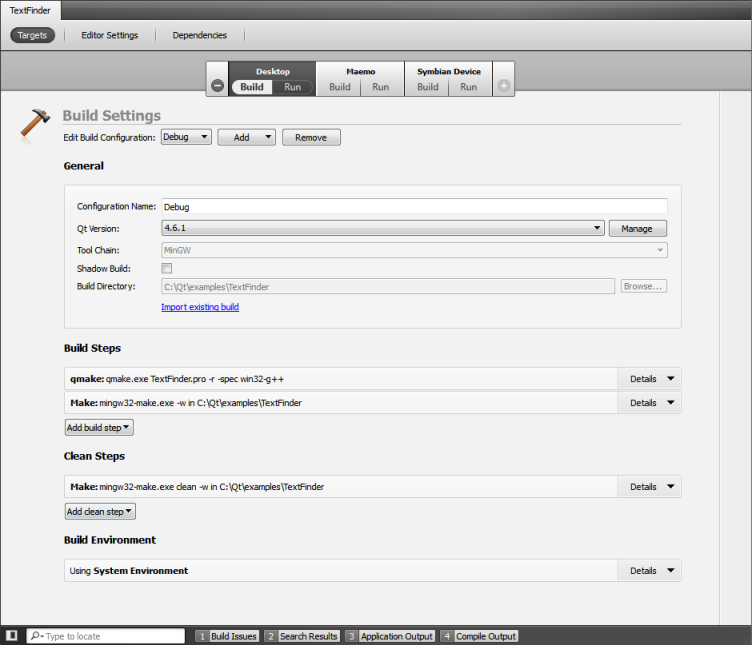 The build system of Qt Creator is built on qmake and make. In Build Steps you can change the settings for qmake and make. Qt Creator runs the make command using the Qt version defined for the current build configuration. You can use the cleaning process to remove intermediate files. This process might help you to fix obscure issues during the process of building a project. To add a clean step using make or a custom process, click Add clean step and select the type of step you want to add. By default, custom steps are disabled. Activate custom steps by checking the Enable custom process step check-box. To remove a clean step, click Remove Item. To change the order of steps, click . You can specify the environment you want to use for building in the Build Environment section. By default, the environment in which Qt Creator was started is used and modified to include the Qt version. Depending on the selected Qt version, Qt Creator automatically sets the necessary environment variables. You can edit existing environment variables or add, reset and unset new variables based on your project requirements.